Looking across London from the south bank of the Thames it is easy to miss a golden ball of flame, which can just be seen between the modern office blocks, to the right of London Bridge. The City’s skyline has been transformed in the last 40 years with Wren’s St Paul’s the tallest building for over 220 years it is now 30th in the list and soon to slip further down as new glass and steel structures are being completed. The shining orb marks the location of The Monument, which is the work of Christopher Wren and Dr Robert Hooke and is a reminder that London’s greatness lies in its history as much as in its tall buildings. The Monument was commissioned in 1671 and completed six years later to commemorate the Great Fire of London, which started on 2nd September 1666 and raged for five days. Two-thirds of the old medieval city was destroyed and a major project of reconstruction begun with the patronage of Charles II and the guiding genius of Wren. 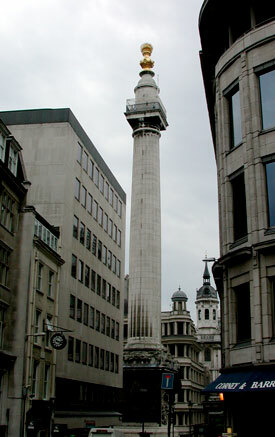 The Monument takes the form of a 50-meter high Doric order column of Portland stone. Upon this column is a viewing platform reached by an internal spiral staircase of 311 steps. Above this is the flaming urn (9ft in diameter), representing man’s taming of the destructive fire. The total height of the monument is 202ft (62m) – the exact distance from the base of the monument to the bakers on Pudding Lane where the fire started. The reigning monarch and patron was not forgotten. Caius Gabriel Cibber’s bas-relief gives an allegorical account of the City’s reconstruction with Charles II at its centre. To modern eyes the Monument may seem both modest in scale and conservative in style, but to the Monument’s contemporaries this was a structure of classical innovation as revolutionary and bold as Canary Wharf and the Swiss Re buildings seem to us today. The scale is also difficult to grasp, but when completed in 1677 it towered above the surrounding buildings and its golden summit could be seen from miles around. Visitors to The Museum of London should take a look at The Rhinebeck Panorama, to see how it dominated the skyline 140 years after its construction. ‘But Popish frenzy, which wrought such horrors, is not yet quenched’. The inscription was only removed in 1831 when a parliamentary committee established that the destruction of London was the work of an over cooked loaf and not the sinister machinations of a Catholic plot. Another dark aspect of The Monument’s history is as a place of suicide. On June 25th 1750 a weaver by the name of William Green left his watch with the doorkeeper, climbed the 311 steps and threw himself from the viewing platform. Another five people were to end their lives in this bloody way until the viewing platform was caged in 1842. On the 16th February The Monument will embark on a new phase in its history, having been closed for the last 18 months for a major renovation costing £4.5 million. The monument undergoes this treatment every hundred years but this time a great deal of work has been done. There is now a greatly improved viewing balcony and a glass pavilion at ground level with live camera links for those unable, or unwilling, to make the arduous journey to the top. Another innovation is that Wren and Hooke’s cellar laboratory is being opened to the public for the first time and a flagstone is to be laid in recognition of Robert Hooke and his work. Despite being crowded out by surrounding buildings, The Monument still manages to provide some of the best views of the modern city with Tower 42 and The Swiss Re buildings to the north and the ‘shard of glass’ skyscraper now emerging beyond the Thames to the south. There can be no better place to imagine London’s glorious and troubled past while also glimpsing its future.